It’s often said that it’s not what you know but who you know and I just happen to know my sister, Rachael, very well. She happens to know Argentinean wines very well by virtue of her role procuring them from Argentina for our brother-in-laws restaurants, Porteno and Bodega. 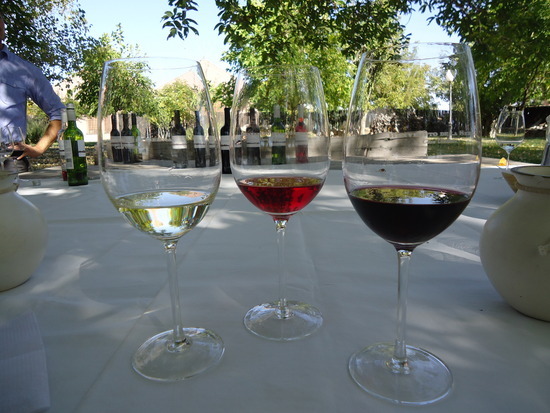 Although our trip to Mendoza was ostensibly for pleasure, the business side of things afforded us an extraordinarily privileged insight not glimpsed by most outsiders. No sooner had we checked in than our self-appointed guide and chauffeur – Tom and Dario from Jed Wines, met us. The five of us (including my other sister, Rebecca) squeezed into Dario’s car for a long and picturesque drive into the Uco Valley. We also gained an insight into Argentinean road rules, or lack thereof. The Andes sprawled out in front of us and loomed larger the closer we got to our destination. The Andes had always been on my list of things to see but prior to this day, I hadn’t given any consideration to the fact that I was actually going to see them on this trip so being up close and personal was all the more dramatic and stunning for that fact. Just when I thought the scenery couldn’t get any more spectacular, we arrived at our destination – Benvenuto de la Serna where we were welcomed with open arms and ushered through to a picture perfect field, complete with a babbling brook and a table under a spreading walnut tree heavy with glasses and wine bottles. Our hosts for the afternoon, Inaki, Jose and Frederico talked us through a tasting of their range with the easy charm of old friends. Every time I turned to my right, I had to pinch myself at the sight of The Andes and then again to my left to these beautiful people in this scene straight from a too-good-to-be-true movie. 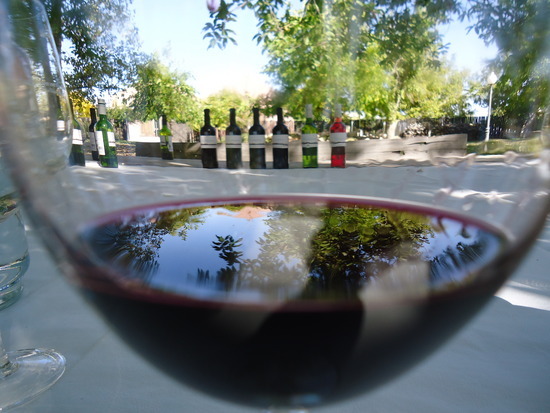 We stayed longer than intended and missed our lunch appointment, so they arranged for food to be prepared and bought out as we passed the afternoon in the warmth of their company and the gentle Mendoza sun. The following day we were treated to a champage breakfast which is to say we started the day at Cruzat Champagne Vineyard. 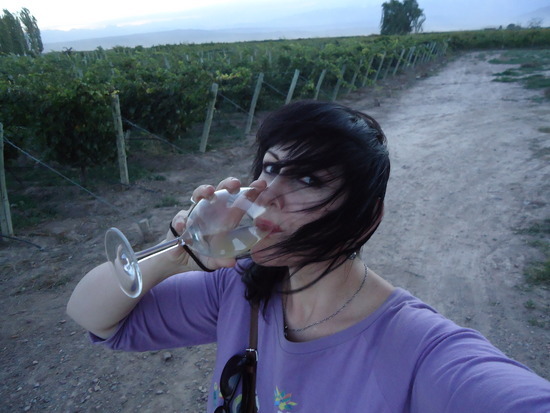 We were met here by Don Pedro, a seventy-something ex-professor who decided to go into wine making after being forced out of the education system by the ruling fascist forces for defending his more socialist views and those who shared them. You know straight away, I love this man! He humbly and generously walked and talked us through the entire process from the vine, to the blending, to the bottling and cellaring, to the inserting of the cork, to the popping of it. 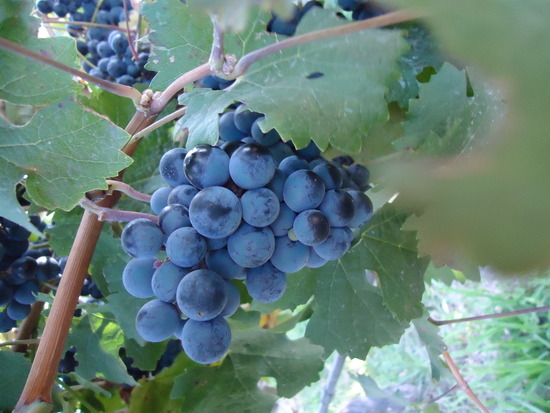 He shared his stories as we sipped away on his balcony overlooking his exquisite vineyard. Listening to him describe his champagnes only made them all the more captivating, not least of all when he compared them to the likes of Brad Pitt and Leonardo Dicaprio! It was with a heavy heart and light head that we left Don Pedro to our next rendezvous down a long and dusty road to an unmarked vineyard, found only by following the lead of its owner, Gillermo of Marguery Wines. 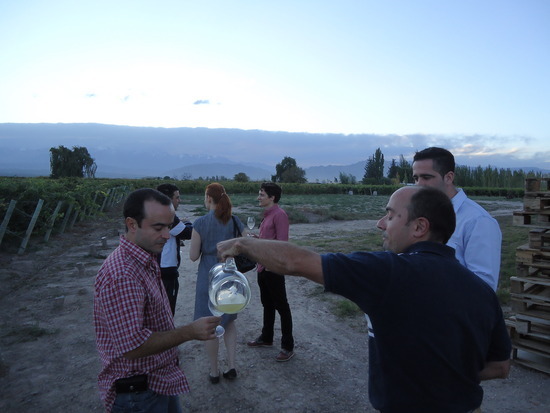 We walked through, picking and tasting the last of the vintage straight from the vine, all with The Andes as a backdrop. He then led us up some more long and dusty roads to his much smaller, less extensive but just as inviting operation where we had the rare opportunity of trying the wines in the very early stages of their development straight from the vats. Although Trapezio was our last vineyard of the day, we still had one more winemaker to meet. We had the extraordinary privilege of being invited into the home of Matias of Eral Bravo wines for a private tasting and dinner with his family. Up until this point, we hadn’t actually seen much of Mendoza city and what we were treated to tonight was certainly not representative. Matias picked us up and drove us through increasingly exclusive suburbs until we reached the security gates of his own. Their home was the stuff of design magazines, in fact it was designed by a famous architect and personal family friend whose name currently escapes me. The opulence would have been intimidating if not for the genuine warmth of our hosts. The following day was a public holiday, Good Friday, but that turned out to be an understatement. Bearing in mind that today was a public holiday, especially in a country as Catholic as Argentina, the doors and hearts that were opened to us were all the more gracious and generous for that fact. 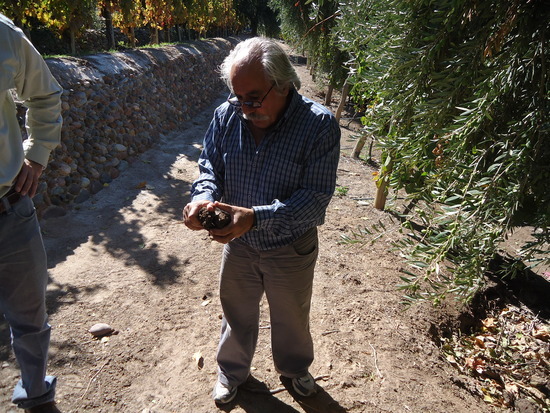 Our first stop was to what has got to be the quintessential Mendozan vineyard – that of Angel Mendoza – yep, that’s his name, Angel Mendoza! It wasn’t surprising to learn that he’s widely regarded in the industry and many of the people we’d met on previous days, attributed much of their learning to him. None more than Lucas from Trapezio who, as it turns out, is Angel’s son. He was there when we arrived hard at work squishing family grapes. It was such a delight to see him again so soon. Angel took us on a tour of the vineyard while Lucas changed into something less stained. 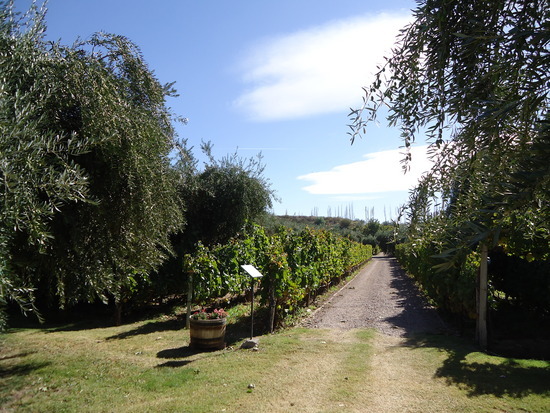 The vineyard itself was spectacular with massive olive trees creating avenues and protecting the vines from the sondo that was still gently blowing from the day before. Naturally we ended with a tasting but there’s no way of knowing which was more intoxicating – the wine or the Mendoza family charm. They waved us goodbye as we headed to our final wine destination – Alpamanta – by far the most remote and taxing on poor Dario’s car as we took half an hour to traverse the last 5kms down a very rocky and dusty road. When we arrived, the asado (barbecue) was already fired up and a sumptuous Good Friday feast laid out for us to share with the family. The adults wined and dined while children and dogs ran wild. 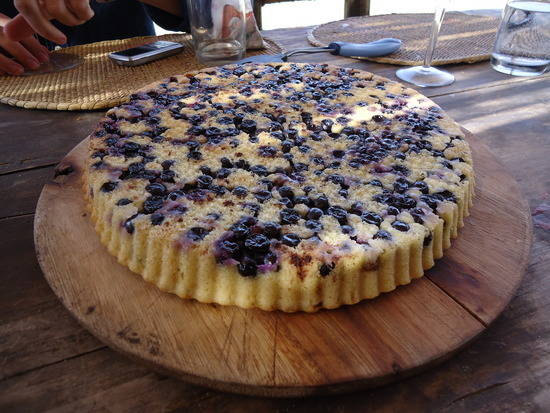 The highlight for me was a delicious malbec tart served with barbecued quince and dulce de leche – malbec being the grape varietal for which Mendoza is renowned. The tour that followed once again showed us the extraordinary diversity of winemaking (and winemakers) in the region. 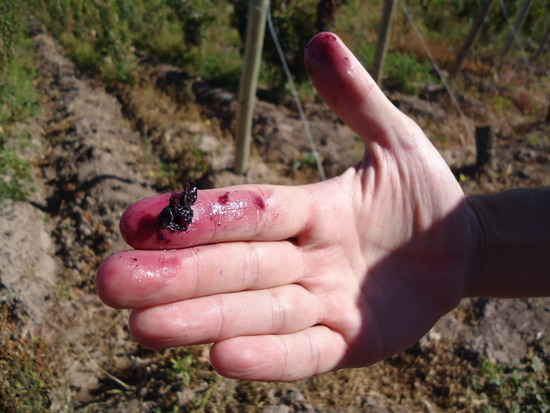 Andreas’ wines are entirely organic, as are all his farming methods which include such rituals as burying a bulls horn stuffed with its own poo in a corner of the vineyard to encourage growth and the hanging up of a deer’s bladder filled with certain flowers to ward off bad luck. It definitely seems to be working for them. *The ‘sondo’ is a hot wind that blows over The Andes from Chile, stirring up the desert dust, wreaking havoc on all in its path. Without exception, the locals despise it but as tourists, we enjoyed the novelty of it even though we were covered in dust.